The trooper was taken to the hospital with minor injuries. MSP says the icy road conditions on the highway were the reason for so many crashes Saturday morning. 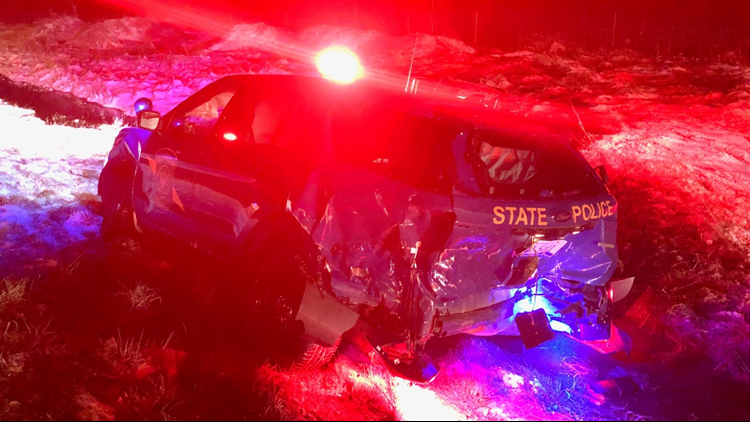 CALHOUN COUNTY, Mich. - A Michigan State Police cruiser has been seriously damaged after being rear-ended on the freeway Saturday morning. The Battle Creek Fire Department was dispatched to a crash around 3:15 a.m. While heading out there, crews came across several slide-offs on eastbound and westbound I-94 between mile markers 92 and 95. Only one minor injury was reported at the time. An MSP trooper was called to the scene of a crash on eastbound I-94 near the 92-mile marker. The trooper was on the shoulder of the freeway investigating a one-vehicle crash, when he saw a second vehicle lose control and strike the cable barrier. 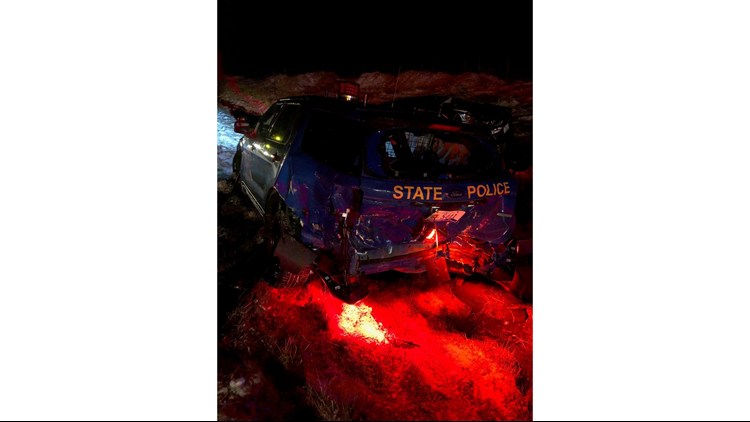 While the trooper was calling for assistance, his patrol car was struck from behind by another vehicle. That vehicle spun out and came to rest in the travel lane and was then clipped by a semi-truck. Eastbound I-94 was shut down at mile marker 93.6, as the four vehicles were blocking the south shoulder and lane, with accident debris in the north lane. The trooper was taken to Bronson Hospital in Battle Creek and treated for minor injuries. The driver of the vehicle that struck the patrol car, a 30-year-old woman from Galesburg, was taken to a hospital in Kalamazoo with minor injuries. The driver of the semi-truck, a 67-year-old man from Jackson, was not injured. MSP says icy road conditions were a contributing factor to this incident. An MSP cruiser was significantly damaged after being rear-ended on the freeway in Calhoun County.